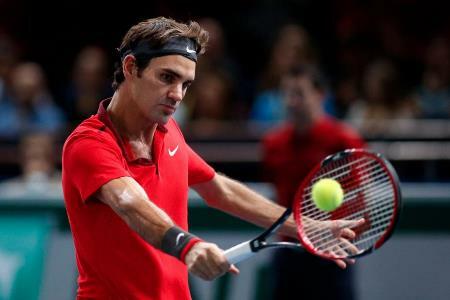 Hey guys, a routine win for Federer here as he comfortably defeated French Qualifier Lucas Pouille 6-4 6-4 to move into the Quarter Finals at the BNP Paribas Masters. This one always looked like an easy matchup on paper and although Pouille played well the Swiss was able to play in 2nd gear throughout and get himself over the line without expending much energy after his long 3 setter vs. Chardy on Wednesday. The win has set up a tie with Raonic who beat Bautista-Agut earlier in the day and I'm sure he'll be keen to put in a better showing against the GOAT than he's managed in their previous 2 encounters where he's been made to look amateur. 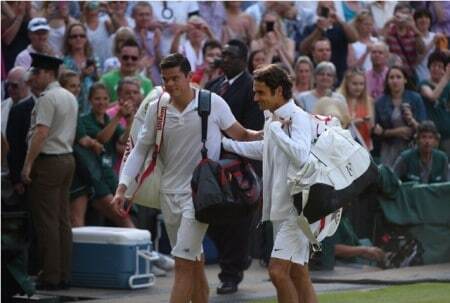 As we've seen many times against an inexperienced opponent Roger won the toss and elected to receive. Pouille responded well though holding to 15 after making some solid first serves. Roger then levelled to love and both players traded back to back holds as the scoreboard ticked along to 3-3. Up until this point Pouille had look impressive on serve, using the outswinger on the ad court well and backing it up well with some meaty forehands. However in game 7 Pouille lost 4 consecutive points on serve from 40-15 to get broken and Roger took the first set 3 games later 6-4. Looked like Fed just decided it was time for a break after seeing what Pouille had to offer. The second set was more of the same with Pouille again serving well and playing the right sort of match by staying aggressive wherever possible and keeping Fed honest at the back of the court. The Swiss had a break point at 2-2 but the Pouille served his way out of it in confident style. However just like the first set he crucially dropped serve at 3-3 to put Roger well in sight of the finish line. Pouille had 15-30 in Roger's next service game but wasn't able to capitalise and although he held to love for 4-5; Fed served it out easily enough to take it 6-4 6-4 in 1 hour 14 minutes. In terms of where the match was won I think Fed was just better on the important points and played well when he needed to. No fireworks necessary just some solid play from the back of the court, transitions in when he needed to and capitalising on some costly Pouille errors. Serve wasn't quite rocking and rolling but Fed didn't have to face a single break point so it was never really an issue. 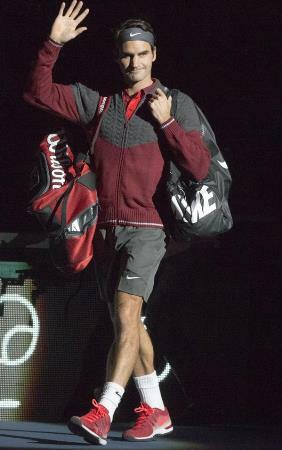 Like I said above just a 2nd gear type of match where Roger knows he's unlikely to get into too much trouble out there. He said in his post Chardy match interview that he'd practised with Pouille once before so he clearly had some idea of what to expect. Not saying he took him lightly but he obviously knew he would have the upper hand regardless. As for Pouille I thought he played a pretty good match; made a lot of decent first serves (out-acing Fed) and played quite aggressive when he had chance. Just a few mistakes at key moments to get broken once each set were his downfall. Beating Nieminen & Johnson in qualifying and then Karlovic and Fognini in the main draw is a good tournament though so he could be one to watch in the future. Next up is Milos Raonic who defeated Roberto Bautista-Agut in straight sets earlier in the day. RBA was up a break in the second set but let it slip and it proved costly. Raonic hasn't been in great form at all lately and Sock should have beaten him in the 2nd Round on Wednesday but unfortunately the American struggles to get it done as he suffered a similar fate vs. Dimitrov in Stockholm a couple of weeks ago. Roger leads the H2H with Raonic 6-0 and has pretty much schooled the Canadian in their last 2 meetings; breaking his serve easily and never looking troubled in his own service games. Milos has gone into all those matches in good form too – so considering he's not been playing that well lately it will be interesting to see what happens here. Will it be the same old story or will he come up with something special? Raonic has one of the best serves in the game right now but on this surface big servers haven't really had an easy time of it. Karlovic was defeated easily by Pouille and Isner knocked off by Monfils last night. Of the other big servers only Anderson and Berdych remain but they back it up with a solid ground game on both wings. Agut was also able to break Raonic twice but couldn't take advantage so I'm expecting Fed to get the job done yet again based on what I've seen this week and in their previous encounters. I think Raonic can make it close if he serves smart – takes pace off, mixes it up but if he just goes for bombs then I doubt it ends well for him. I'll pick Fed in 3 sets. 6-4 4-6 6-4. Steady performance from Fed, kept his opponent at arms length and sealed it with a single break in each set. Good stuff. So glad he didn’t waist any energy there. On to the next match now!! Hey Alex, congrats! Girls rule ATM!! Hey just missed 🙁 Well done, Alex, a girl power! Agree that Roger doesn’t seem at his best, but we don’t want him peaking too early either. Vs. Raonic, will these weird conditions have an impact or not really? He does seem to have got much more comfortable with how the court is playing. Interesting that the fans were cheering enthusiastically for Pouille; suspect that would have changed if it had gone late in a tight 3rd set, but I’m glad overall we didn’t have to find out. Pouille: Well what would YOU do if somebody lobbed YOU like that? Roger: Well first of all, you’ve got to execute the lob better than that, or you’ll get smashed – like this! Pouille, some time later: You mean like THIS?? Roger, smiling: Yes, exactly like that – see, you won that point! Big servers look less effective on this surface. Guess we shall see. Convert his bps otherwise it looks like nishikori, ferrer and berdych will be in London. Yeah he served well I though too. Hit some decent shots too, back behind, mixed it up. Camera angle is the worst bit! Good match from Fed, seemed to understand the surface a lot more as you said Jonathan. Really hoping Muzza will beat Djoker tomorrow, would really help on the world number one… Raonic then anderson or Berdych, could be interesting! 🙂 Come on Roger! Unsure if he will. He’s definitely match toughened but Djoker is the better player. Hopefully watch a reply later but judge by the recap, it didn’t seem physically a tough match for Fed which pleased me. Although 1st serve % was a bit low, both serve PT stats are good and no BP faced, so a solid performance from him. Sounds like Pouille played and served solid and courageously.The guy might be picked for DC final, anyone? And what went wrong with Stan??? All the French out now – are they going to decamp to a clay court and practice for the next few weeks? Yeah, I thought he was going to win, too :(. At least he’s being a good boy and practising his doubles, though I don’t see him and Leander getting through the Bryans. I heard he had a virus. Still 30-0 up at 5-4, should be closing it out. What was I saying about one break per set?! Fed was def in 2nd gear, despite the hype around Pouille and was barely troubled; a gd thing after last night, as I did think he looked a bit weary( or was he bored…)? Anyway, got it done, can get some decent rest as playing afternoon match on Friday!! 3.30pm local time! Will no doubt go up several gears v Raonic and I see him coming thru in 2 if he can get his energy going!! Will Muzza beat Novak? That is the question? He can but … Novak looking good to go deep here!! The no 1 still in his control. Taking Kei over Ferru and Berdych over Kevin but in 3 tough sets! There is a youtuber who is called alexrf. He makes the highlights in literally a couple of hours after the match and he does highlights of every single rf match. They get removed almost immediately. ATP started exercising copyright stuff. Stan doesn’t seem to be there mentally but I was impressed with Anderson’s consistency from the back court – unusual for him. He fought for and deserved the win. Oops, something gone wrong with the timestamp here? Thanks for the report, Jon – I didn’t expect it to be up yet. What an incredibly slow match: I had to keep watching the BBC livescores (TV) because my Internet was so slow, and couldn’t believe how slowly the games were racking up. I wondered if Fed was having more trouble than he’d anticipated – kept thinking “He ought to have won another game by now, surely?”. I know I’m a night owl, but it is definitely not gone 2 am! Yeah must be from that server reboot. Should be fixed now, was an hour in front. Stan was ill I think Richard, some virus he’s had for a few days. I think he might play well at WTF. Ofcourse Nole beat Monfils, who fought great in the 2nd set (why not in the first??). The TB he made some errors. But Jon, you are right. Some points that Monfils makes…. wow. Just wow. He is a clown and a showman, but when he puts his mind to it, the winners he makes…. wow. Just hope Roger won’t have a problem with playing early. So good to see that he doesn’t get all the nightmatches. One disadvantage of all the French losing early is that they can practise now for the DC, since none of them will play WTF. Ps Jon, thanks for the post. And Live Chat was great 🙂 Go Roger. So proud that he didn’t make a too big deal out of winning out of respect for Pouille. Switzerland is not winning DC if Stan doesn’t show up. Fedrinka haven’t a doubles match since…. since when exactly?? The frenchies have some good dubs teams, so I’m thinking that dubs is for them. So Fed needs two points (not guaranteed on clay, depending on how hot Tsonga and Monfils show up) and Stan needs another. Federer and Stan actually played doubles in QF against Khazakstan and lost. I watched that match, and would have been funny if it wasn’t so awful, with Feds and Stan running round like headless chickens. Stan was truly terrible that day, spraying volleys out of the court/into the net. I remember one particular moment he was at the net and completely whiffed a volley and Federer came round behind him and hit it for a winner. Although it’s fair to say that Feds was not at his best either. It was fortunate that Federer won both singles and Stan won one single match or they would have been out then! The only bright point ATM is that both French doubles teams fielded at Paris tournament were both knocked out in 1st round. @Katyani Monf has one of the biggest forehands on tour, but he only gets it out sporadically. Easily top 10 talent but mental side he is club level. I think Swiss will gamble on Stan and Fed winning their singles matches and playing someone else in doubles? I’m pretty sure French will choke in front of 27 thousand fans. Hey Jon, I agree. Don’t think that Fedrinka will play the doubles. For sure Chudi with Lammer or maybe with Stan. I think Seve will want to keep Roger “fresh” for the last day…. By the way…. I am kind of surprised to see that Roger (and Nole) don’t get as much crowd support as they are used too. I mean come on, yesterday they were not cheering for Roger. Which is TOTALLY weird. Even if he is playing a French dude. More crowd support for beginner Pouille than for Roger??? I know Raonic has been struggling with a virus for awhile. Hence his poor results. He seems to be better now. I think Roger has a mental edge over him. Hope Fed has the energy to carry on day after day. Yeah Fed has owned him lately. See if he brings anything different to the table today. That should read “Was anyone able to”. Nah. It got sold out in an hour. There’s another batch sale on Monday. Check the website. Ticket systems need looking at it, there’s too many corporate tickets and resellers that are able to profiteer on high profile events. Davis Cup systems were a joke. Well Jonathan, the overgrown smurf got him this time. sorry it never worked how you predicted. I guess he will rest and prepare for the WTF. Nooooooooooo. Shayyyyyyy. World no. 1 just got a lot harder, unless Murray can do something about it. Pity he qualified just the match prior to today’s. Hoping he might not take his foot off the gas against Djokovic. Damn you you serve bot Raonic. He was simply on fire on serve. Not really sorry that Roger’s out, although annoyed that he should lose to Raonic, but frankly, from what everyone’s been saying about the surface, it sounds as though it was only a matter of time. Why did Milos have to pick today to play so well? Anyway, this gives him a clear week to rest and recover, which may not be a bad thing. I was worrying that all these matches were going to catch up with him eventually.